With the parent’s game over, Hannah wandered down the stall row and came to Grace’s pen. The mare met her at the gate with her nose toddler high and gave her one of those deep growl-y mare nickers. Almost a moan, slow and quiet. And Hannah answered her back. The toddler’s voice droped so low that she almost sounded possessed. Which she clearly was. But not in a bad way. “Uuh-oo-oo-uuh” came from behind Hannah’s belly button and barely cleared her lips. But Grace heard it. Hannah is bi-lingual. She has one answer for humans, and a separate answer for horses. She is that smart. Disclaimer: I think kids are kind of in the same boat as mini horses. They are fully complete, sentient creatures who know as much as anyone else and deserve respect, but we see them as pint-sized caricatures of the real thing and diminish them. What if Hannah shares that deep well of intuitive knowledge that horses do, and just lacks the superficial communication skills that we adults use? The horses seem to think she is communicating fine. 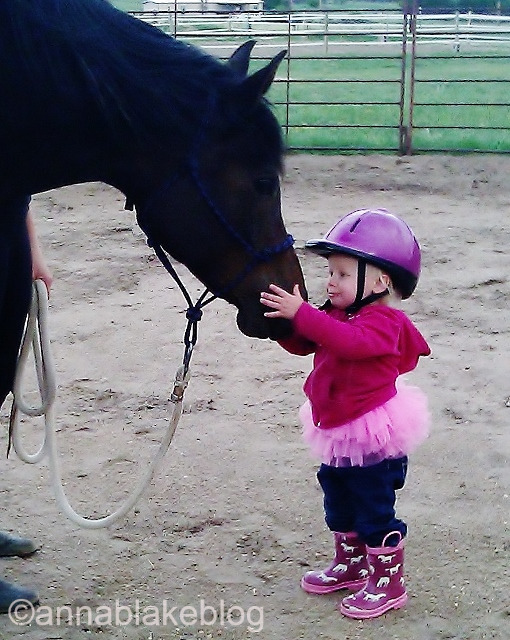 Most of us have had that experience of seeing horses take care of little kids. The same horses that are a total handful for adults who ‘know how to ride’. At the same time, we remember riding as kids, free and effortless. We knew less and got more from our horses. When did riding get so complicated? What have we forgotten? Hannah is right, we do need to use a separate language for horses. They don’t speak English just because they can take a canter cue from the word Canter! Responding to a verbal cue is good, but was it the actual word they understood, or your body language before the word? We can chatter away at them; we can coo and cluck with our horses and feel just great. Don’t mistake that with a real relationship based in a shared language beyond words, spoken with our bodies and our intentions. A trainer can’t literally teach relationship, they can only try to inspire a rider to feel it, and then acknowledge it when a horse and rider have the experience. Trainers are translators. If humans are the more evolved species (the jury is out on that but going with that assumption,) then it is up to us to move beyond our more limited senses and evolve our language to meet the horse. More importantly, if we want to progress farther with our horses, we have to communicate even more eloquently. Just getting louder doesn’t work. How many times do we climb on a horse and then talk about him behind his back. We sit in the saddle and ignore him, while we have an intense mental conversation with ourselves about our horses. We check mental lists of technique and we put dark thought into anxiety or worry. Our critical thoughts run like a rat on a wheel, while we pander to our worst opinions of ourselves. How is the ride going so far? Is this any different than texting and driving? Let’s focus on us first. Take a body check. Are you sound? Is your body soft and open, or does tension in your shoulders cut off you off at the neck? Are your hips tight and restrictive on the ground? Don’t expect a horse to do their best work if you are lame or stiff. Slow down, take some time and breathe. Inflate your ribs, let them be elastic. Exhale out the day’s drama. Inhale and know that you have all the time you need. Exhale out any erratic human emotions. Inhale and know you are fine as you are. Exhale and feel balance in your body. Here and now, reset yourself to less judgement and more acceptance. Less thinking and more feeling. Less correction, more direction. Be. Here. Now. By the time you get to the mounting block, know that you are crossing a border into another country. You can play the ugly American, talking loud and looking for a McDonalds for lunch, or you can open your mind and learn the local customs. The best trips are the ones where both sides respect and learn. And the sum of these parts make a better world. It’s the one thing that all my clients say they want most of all: A better relationship with their horse. Take a cue from Hannah. If you want to have a more elite connection with your horse, develop your nicker. Meanwhile, Hannah and Grace are still at the gate. It isn’t about treats, and it isn’t that the mare can’t leave if she wants. They are being together. They are acknowledging each other by sharing breath, sharing time, and sharing their heart’s language. Existing in the present moment without expectations or demands is an art form. Respect the masters. I never try to train people, but it might work with them too. Thanks, Linda. Your dogs ‘speak’ well of you. I got pulled in with the cuteness warning. I’m a Mee-Maw, what can I say? I had to go back and read this twice to get the message, thanks to Hannah’s photo. At Agility, the coaches/trainers have said more than once “If we called it people training no one would come” But that’s what it is. The dogs already know how to jump and climb, we have to explain where they jump and what they climb. They read my body language long before I knew we had any. If you look around in a larger group you can see the people not connected to or communicating with their dogs. I sometimes think our animals are just waiting for us to catch up to them. Hannah has got it right! lovely article Anna. Spot on. Thanks for the great comment Chris. There might be an age limit on the pink tutu, but I still need more research on that! Loved the post very sweet.